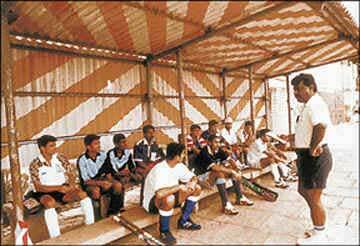 "... Mukesh Kumar is not a good trainer during camps. Mobility with other players is wanting. He is not a team man, and a liability to any team at the international level." "... To continue playing Dhanraj Pillai will be disastrous for Indian hockey. With due respect to Dhanraj for his contribution to Indian hockey, I regret to submit that the IHF should counsel him to retire, before it decides to drop him." he Commonwealth Games team included ten players who also figured in the World Cup held a couple of months earlier. I retained the core of the World Cup team, and thus ensured continuity. I relied on form and experience. I included all the five players who were indicted by my predecessor V. Bhaskaran.
" ... He can play only when the ball is played to him. He is a poor re-tackler and tends to lose the ball against the rhythm of the game. Not a good trainer during camps. Mobility with other co-players is found wanting. He is not a team man, and is a liability to any team at the international level." I can't believe Mukesh is not a good trainer. He listens to coaches. No doubt he is an introvert, not often seen mixing with others. That is his nature. That does not mean he is not a team man. Mukesh is fleet-footed and hence he loses the ball at time. His strength - speed running with the ball - should be utilised as part of the tactical game. He is still the best outside-right in India. He has to only improve on his fitness level, the rest are all surmountable. "... Dhanraj's performance in the World Cup was below par. As captain, his involvement with the team and management was highly wanting. He may have played well in the past, but of late, he tends to concentrate on matters that are unconcerned to him, and hence his performance has dropped badly. To continue playing Dhanraj will be disastrous for Indian hockey. With due respect to Dhanraj Pillai for his contribution to Indian hockey, I regret to submit that the IHF should counsel him to retire, before it decides to drop him." Dhanraj did not deserve such severe criticism. Like every senior leading player, he expects many things for playing for his country. It is for the IHF management to speak to him and motivate him. An outright rejection from the team is too severe. Probably, Bhaskaran could not develop a cordial relationship with Dhanraj. Ever since Bhaskaran's World Cup report was leaked and made headlines, the media focus centred around whether the players indicted by him would be allowed to stage a comeback for the Commonwealth Games. Every reporter I spoke to goaded me on this topic. I wondered how the media was so oblivious of the fact that the IHF hardly bothers about coaches' opinion on player appraisals. It has been, and will continue to be, an exclusive right of the self-righteous IHF.